Get inspired by 60 hand-lettered alphabets and the artists who draw them! Designer and illustrator Jay Roeder has compiled a vibrant collection of alphabets that will have you racing for your pens, markers, and sketchbooks. 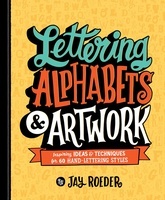 He explains everything you need to know to create each set of letters, from pen strokes to fun embellishments. The alphabets are divided by typographical approach for easy navigation. Whether you're looking for an elegant script, a whimsical collection of doodle-inspired letters, or a striking set of dimensional letters, you'll find something that perfectly suits your project be it a card, journal page or framed artwork. Each section includes a beautiful gallery showcasing work by the author and other artists.